YOGA PARTY! Yoga is all about connection and community. The word yoga means to unite or join. On a personal level, we use the breath to link our body and mind. On a universal level, we all share the same air that we breathe; and yoga is one of the best ways to celebrate life together. I have been lucky enough to meet an incredible group of amazing moms and women who all share similar values. We love to move, play, spend time with our kiddos and let go every now and then and have a glass of wine with the girls. Most recently my girlfriend, Ashley from The Cuisinistas Club, invited me to lead an outdoor yoga session to help raise money for St. Jude Children’s Research Hospitals. 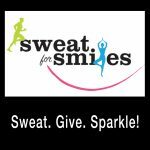 As you know, The Cuisinistas Club’s new Sweat for Smiles Program is a series of fitness-themed parties that raise money for charities. My yoga class kicked off the series, it was completely donation based; yet we ended up raising almost $1000! And, we all had an awesome time together. Ashley did an incredible job of party planning, check out this month’s “Plan It”, and “Cook It” blog posts to get more great ideas. It can be really easy to throw something like this together with a group of friends in your area. Make sure you pick a good location. We did the class outside while we had nice weather and since the class was free, it was nice that the space was too! But, many local churches or schools are willing to donate their space as well. Provide equipment or make sure everyone knows to bring their own towel, mat, etc. Make a fun evite and or FB page group and start spreading the word. If you’re the teacher, plan a fun playlist of songs. Make sure you can modify for all levels. Put together a fun flow and sequence to get everyone focused and warmed up right away. Then, make sure you throw in a few challenging postures for everyone to work up to. Don’t take yourself too seriously. Although, I wanted to give these gals a great class, there was a moment when everyone starting chatting and I just went with it. Here’s a fun sequence of poses you can do at your next yoga party or class. You can also try this at home when you want a heart opening routine that reminds you to give to yourself and then go out in to the world and and find something worthy to give back to as well. Start with a few cycles of sun salutation then hold each one of these poses for 5-8 breaths. Make sure to do both sides in postures like crescent lunge, warrior 1, etc. Downward Facing Dog: Downward Dog is an awesome pose for many reasons. The inversion of this pose, increases blood flow to your head, which can make you feel more awake. Perfect for the afternoon slump many feel after lunch at your job. I especially find it helpful when I am stressed because it releases tension throughout my entire body. I can feel the tightness in my shoulders, back, jaw and neck when I initially go in the pose. Downward dog stretches out every part of my body and releases my mind. Start on all fours, tuck under your toes and lift your hips up and back. Press firmly in to your hands and try and transfer your weight back in to your legs. Engage your abdominals and stay and breathe for at least 8 to 10 breaths. Crescent Lunge: This move tones while your body while alleviating tension in your body. Perfect pose to do after a stressful meeting! Start on all fours (you can warm up with some cat/cow breaths if you’d like), then lunge your right foot forward. Slide your left knee back a bit on the mat, and shift your hips forward as you lift your arms up and arch your chest back. Keep your lower back long, your abdominals and pelvic floor engaged, and arch out of your upper back. Keep your shoulders soft as you reach long through your arms. Hold 5 to 8 breaths. Tree Pose: Tree pose is all about being grounded (through the trunk of the tree) and finding balance. The tree also symbolized the breath of life running through us. As a working mother and wife, finding balance can sometimes be a challenge. I’ve found that balance for me means incorporating my family into my life and my yoga practice. Dancer’s Pose: This pose creates strength, openness, and an elegance of form and action. Dancer’s pose cultivates powerful energy required to balance on one leg while in a deep backbend. The movement opens your heart out to the world. Dancer’s pose helps bring me confidence and gives me energy to do all things with passion – from training my clients, to playing with my son and sitting down for dinner with my husband. Bow from all Fours: Bring your right leg back to all fours (do a few more cat/cow breaths if you wish), then extend your right arm forward and your left leg back. Reach around behind you and catch your left foot with your right hand and bow the leg. You just stretched the front of the left leg in crescent lunge, so this should feel good. Hold 5-8 breaths. Camel: This is an awesome posture for lifting the chest and opening the shoulders. Start on your knees and place your hands on your lower back. Squeeze your shoulder blades together and raise your chest up to the ceiling. Stay here or reach back for your heels. Hold and breathe 5 breaths. Come up and repeat one more time. Bow Pose: Come back to all fours and go through knees/chest/chin to lower to your belly. Slide forward to baby cobra, then rest your head on the mat. Bend both knees, reach around with your hands to catch your feet, and lift up in to a full bow pose. Breathe in to your heart center, open up your shoulders, feel the tension releasing in the front of your hip flexors and quads. Hold 5 to 8 breaths. Lower down. Child’s Pose: After releasing your feet in bow, place your hands by your shoulders and press back to extended child’s pose. Hold for as long as you wish before coming up to all fours and repeating the entire sequence again. This time, start with your left leg in lunge, bow the right leg on all fours, and practice your full bow pose again. This entry was posted in Blog, Party DIY. Bookmark the permalink.